Join Hydrologist and Rotaract member Sol Henson on his journey to assist rural villagers in Southwestern Uganda to implement water projects. On this blog he shares his experiences and stories in this remote and strikingly beautiful landscape. The Rotary 3H goat project in the community of Kitariro. A consistent approach- Remaining consistent with our methods of community interaction and our expectations of community involvement. 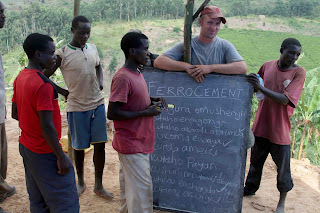 A focus on individual relations with members the communities- This has seen a huge boost since Tor and I have nailed down the basics of the Rukiga language and can now interact on a higher level of engagement with the people we are trying to support. Using existing community resources- We have maintained our efforts on using community based organization structures to run the projects while emphasizing community representation. We have also focused on using the existing skills of the communities as well as the material resources available to each community. The past month has been a good one for our Rotary Grant in the Kanungu District. In addition to marked progress on our deliverables, we have taken significant steps towards project sustainability as well. 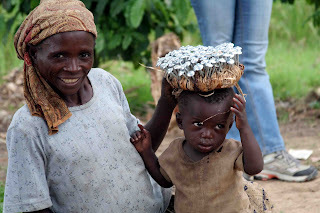 For the past few weeks we have been conducting an internal evaluation of our work carried out by the Batwa themselves. I will intersperse the following update with quotes from the interviews that have been conducted. A spring protection in the Batwa community of Kebiremu was completed successfully, and initial talks with the Batwa and Bakiga communities there show a high level of participation, ownership, and overall sense of accomplishment. In the words of one man, when asked how he participated, "We all cooperated to carry sand and stones." 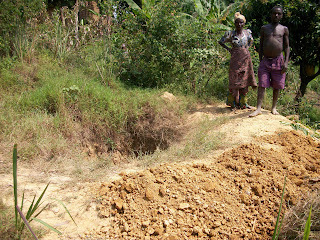 A local mason from Kanungu town directs the community of Keberimo for the protection of their spring. The spring serves about 40 Batwa and Bakiga families. People have expressed great happiness with having a protected water source. The following sentiment from a Mutwa man was echoed in every interview conducted: "Before having this protected water, we used to fall sick almost every day. I haven't seen anyone sick since we got this spring." 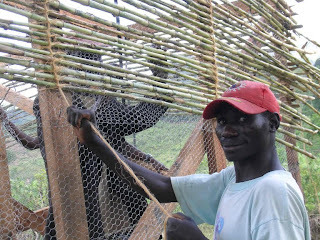 A mukiga man looking to muscle up some stones used for the Keberimo spring protection! Additionally, we continue to collaborate with the Bwindi Community Hospital on a spring protection at the mixed Batwa/Bakiga community of Mukungoro. The community there has nearly organized everything required for us to begin work; this includes bringing massive piles of rocks to the site, and organizing community labor for the project as well as food and lodging for the masons involved. Sanitation work has leaped forward. In the last report I mentioned that work had begun on 3 latrines, at this point in time that number has jumped to 10 with a completed foundation at least. This means 10 Batwa families have invested the time and energy into digging a pit 16 feet deep to protect their family's health. A Batwa couple stands next to their completed 16 foot latrine pit now ready for Batwa masons to begin construction. When asked how they felt about the latrine project, people answered with things like, "I feel very good about this. People will not fall sick," or "I feel very good about this project so far. 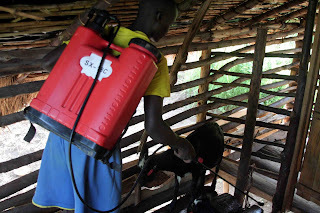 It keeps us from using the bush," or "It helps us so that we don't fall sick." Work on latrines has included one for a nursery school at Kitariro, which has included contributions from both the Batwa and Bakiga in terms of money, labor and materials. A Rotary trained mason demonstrating a a local method of reed tying for building structures. 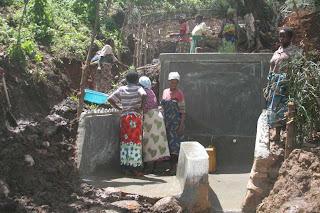 The work on these latrine projects has been conducted by our Batwa masons. These men continue to shine as intelligent and responsible community members and masons, capable of doing excellent work. They are now laying out foundations to square, pouring stepped concrete foundations on sloping hill sites, laying brick stem walls, building sophisticated and light weight ferrocement floors, and framing the walls and roofs of these structures without any sort of outside assistance whatsoever. 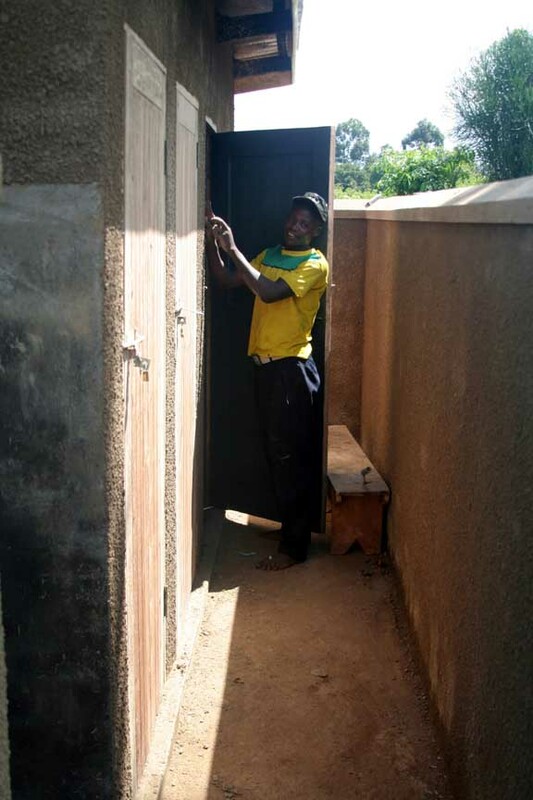 Trained Mutwa mason puts the finishing touches on a school latrine in the community of Karangara. When asked how the vocational training he has received will be useful, one of the masons said "In case my latrine collapses I will build a new one using the knowledge that I learnt from the workshop," and another said, "I am getting some money from it, sometimes people call me and give me a job to build them latrines." 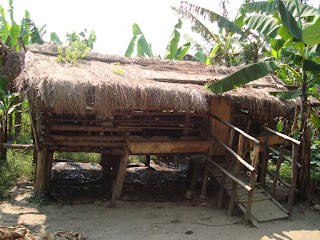 Goat shed in the community of Keberimo. The goat projects are where some of the most interesting and impressive work is taking place. 10 months into the project our three communities continue to feed and water their goats twice a day, patiently planning and waiting for the time to 'share,' meaning when the herd will have grown large enough for every family to have their own goat to sell or eat. In only one instance have the communities sold one of their goats, and this was done to buy medicine for a sick woman and was completely within the limits of the by-laws that the community had decided upon. This accomplishment is impressive almost beyond words, and demonstrates with crystal clarity the ability of the Batwa to work towards long-term goals in spite of their extreme poverty. The chairman of the Batwa community of Bikuto prepares a penicillin shot while our animal husbandry trainer, Henry, looks on. In the meantime, however, the Batwa have been able to enjoy the benefits of the manure and milk of the goats. 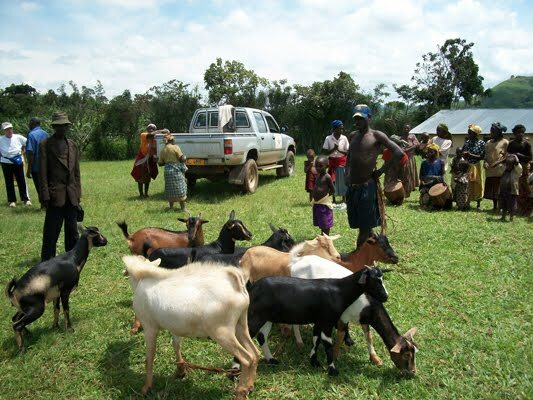 When asked why he wanted to participate in the goat project, one man said, "Because they are useful in that they can give us manure and milk for our children," and another: "So that after sharing I can get my own goat and when I get any problem I can sell it to solve that problem." All projects show good signs of sustainability, though there is still room for improvement. In Byumba, where we protected a spring source, the Batwa mobilized themselves to pressure the secretary of the spring committee to replace money that she had taken. They then removed her off the committee due to her poor transparency and accountability and are now voting to replace her with someone else. This shows a sense of ownership; that rather than have Rotary come in and replace the money, or tell the woman to comply with the community, they went and did it on their own. 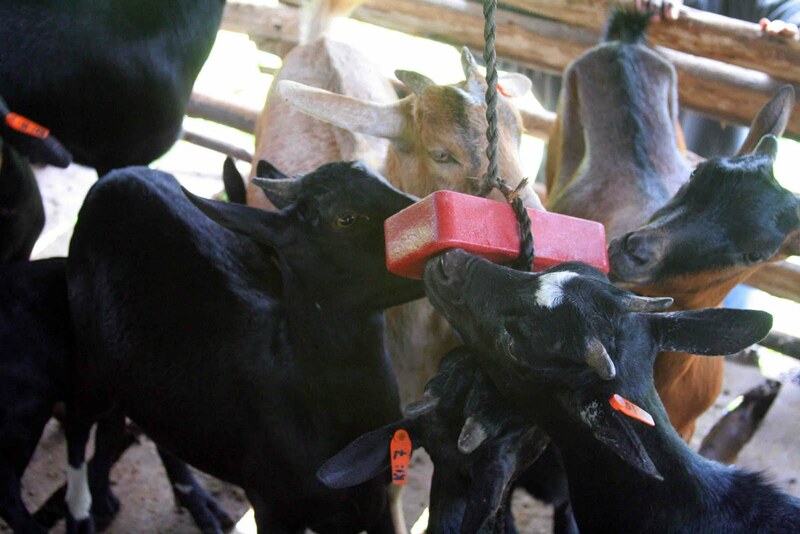 A number of participants in the internal survey stated a need for more education in the areas of animal husbandry and spring maintenance: "Education is required in measuring the drugs when injecting the goats in case they are sick." Water tank in the community of Byumba serving 30 families, a school, and a clinic. Thanks again for following our ongoing work in Uganda! Your comments and questions are greatly appreciated. The heavily cultivated hills of Southwest Uganda with the Albertine Rift Valley seen in the background. I literally live tucked into a corner of the world. One of the few places I have ever been that you can drive into but no through roads lead out except the gnarled dirt track that brought you there. To get to this place you must first travel 10 hours from the capital, Kampala, and wind your way along the crest of the rift valley skirting the edge of the escarpment and then climbing up into a beautiful green valley cultivated to the gills. 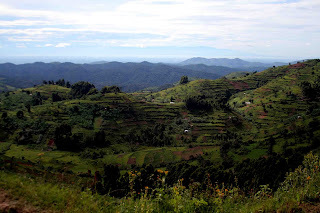 The road through this valley climbs its way past two small trading centers and then abruptly crashes into the Bwindi Impenetrable Forest with no way forward but to shed your steel carriage and take well worn footpaths into the forest south or into Congo west. Just one or two kilometers from the Democratic Republic of Congo Border and only one road leading out gives you the sense that urban civilization belongs to another world. Living here for an extended period of time requires that you travel regularly and/or make fast friends with those you are sharing this space with. Sitting high above this valley atop one of the ridge crests stands two brand new sentinels with flashing red lights. The recently built MTN and Orange cell phone towers are a symbol of how rapidly technology is advancing in Uganda and showers a network signal down upon the small sleepy community of Buhoma. For the last year I have struggled on a daily basis to pass a basic text or communication that would save me two hours of travel. The only place where network could be found was at a tea field that sits across from a notch in hills of the valley where a weak signal could seep through and provide a broken conversation. Many of these conversation necessitated that I drag a translator with me making the communications that much more difficult to coordinate. Now…I can make texts to my best friends in the states from the comforts of the porch of my house as I look into the depths of the primeval Bwindi Impenetrable Forest. Despite my feelings that Bwindi is no longer the secluded location it once was just one year ago, the benefits of improved communication have been immediate. I now make phone calls at will contacting communities where we have ongoing projects to pass along meeting times or key messages. Work is constantly evolving and without the ability to communicate, those changes can lead to angry and frustrated community members. Although only a small handful of Batwa have access to phones we are still able to contact them through their neighbors. Passing messages through intermediaries come come with their own issues however, it is far better than the alternative of missed opportunities due to lack of communication. Perhaps most importantly the Batwa now have an avenue, although limited, to communicate with me when a project issue arises or if they would just like to pass on an important message. Too often the target of humanitarian work is on the poorest communities (ie the Batwa) who do not have access to cell phones and even if they did, do not speak Rzungu. (Rzungu is the language spoken by the Mzungu aka English!) 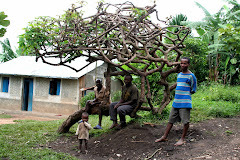 In most situations the Batwa must resign to speaking through middle men who often have their own agendas and/or opinions that can hurt the quality of the information being passed on, and in some cases completely change the meaning. A group of Batwa brainstorming ideas for the sustainability of their goat projects. Their ideas are recorded on the butcher paper in the background by community members. A meeting session that has moved into the cramped indoors to escape the rain. In addition to improved phone communication we have focused on dialogue through meetings that engage and involve community members NOW. 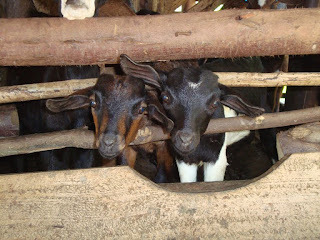 If you have been reading this blog it may come as a surprise to you that this 3H grant includes provision for community nutrition in the form of goat projects. Three Batwa communities have been provided one herd of goats each to care for communally and to share after the goats have multiplied. We felt like meetings in these communities were a great place to start to provide the necessary support for the ongoing projects but also to better understand unseen challenges and benefits to inform future projects. Follow up for the goat projects has come in the form of a number of formal and informal meetings looking to bring out the issues communities are facing with the goats and what their potential resources are to find solutions. Goats with their salt lick. These store bought bars of salt will most likely be replaced by local salt mined from the salt flats of Lake Edward. Boys having a blast climbing around the goat shed. An unintended benefit of goats! 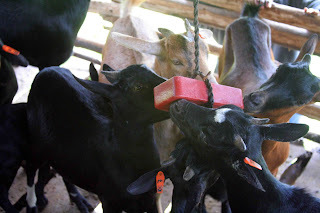 Raising goats as a community is a complicated undertaking that includes a large amount of coordination and cooperation and necessitates strong financial decision-making on how to benefit from the goats in the end. Holding these meetings has played a central role in our understanding of the direction the community wants to take the projects. Having this direction allows us to provide trainings and to encourage meetings relevant to community goals and concerns. 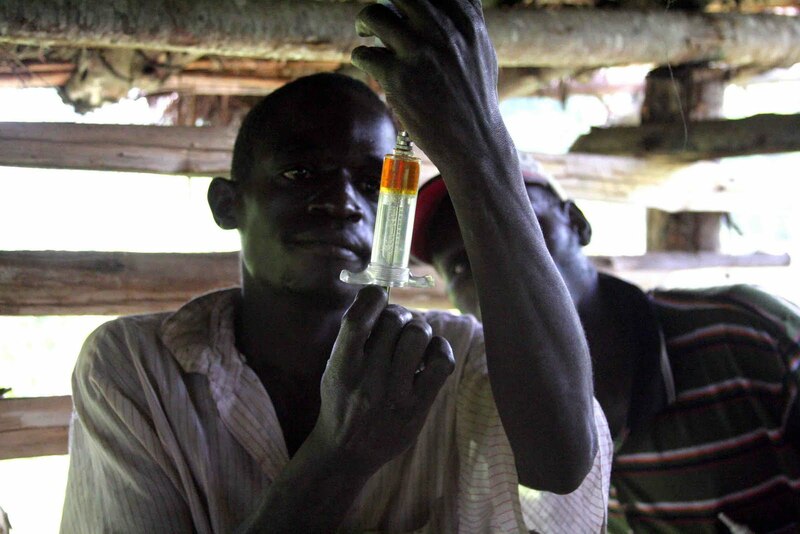 Innocent, a Batwa member preparing a syringe for an injection of Malaria medication. 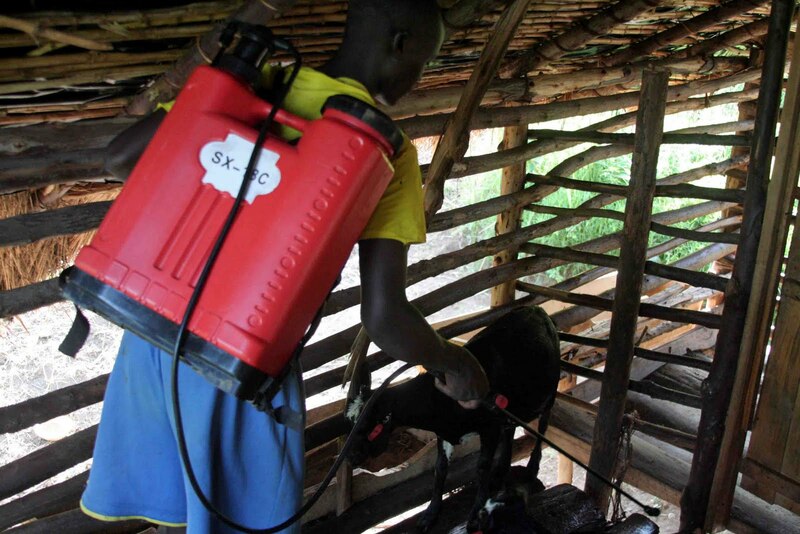 Spraying goats to combat ticks and mange. At times we are showered with questions about if we can provide work gloves, jerry cans, flashlights and other items that we see as provisions that the community must provide for themselves. Despite these superficial questions we came upon some major issues that the communities raised. These included needing more training on providing injections, better cooperation for feeding and cleaning, and wanting further trainings on using manure. Following the thread of issues among the three communities we found that land ranked top among all concerns. 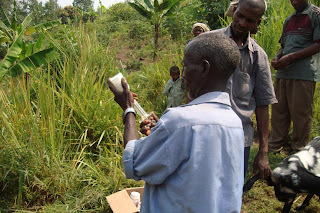 Further probing into the issue we realized that crop raiding of the Batwa goats onto Bakiga land was a major issue that was exacerbated by resentment by the Bakiga neighbors of the goat project going to the Batwa. If you will remember from previous posts the Bakiga are the dominant tribe in Southwestern Uganda while the Batwa are a very small majority in both population, land ownership, and access to resources. This line of questioning and group discussion has led to some upcoming meetings between the Batwa and Bakiga about cooperation and compensation for the sustainability of the project. We’ve found that goats wandering onto neighbors land is not a question of if but a question of when and if communities are not prepared to deal with this issue, conflict will undoubtedly ensue. 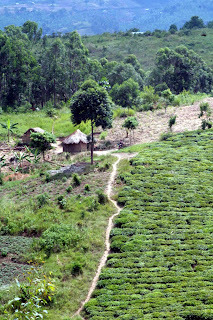 Compounding the land issue is the small plots of land that the Batwa live on and the fragmented nature of the land. 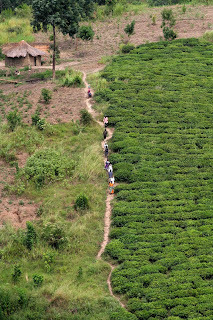 Keberimo and Bikuto Batwa communities live on two plots of land separated by Bakiga land and the community of Kitariro lives on three disconnected plots of land. 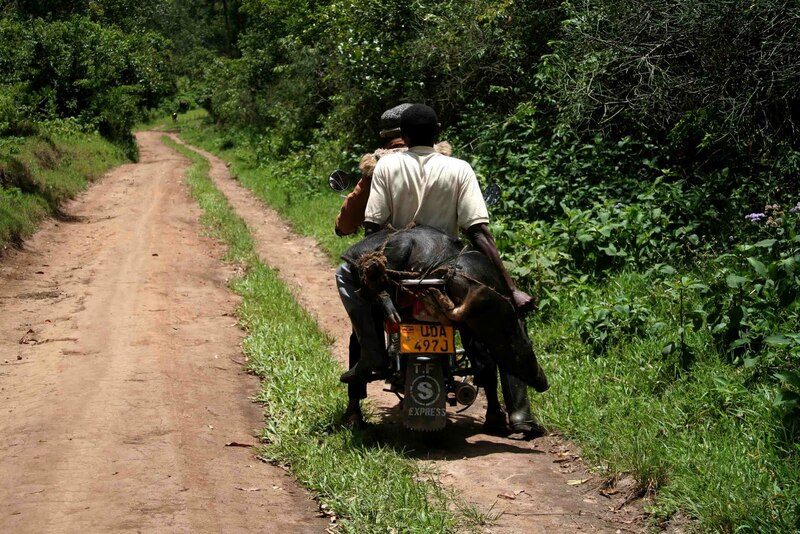 This situation requires the Batwa to cross Bakiga property to graze their goats on other plots of land. I never thought this would be a big issue to just move goats from one plot of land to the next until I watched a group of hungry goats charge out from their shed in Keberimo. Surrounded by Bakiga crop land the goats turned into giant black and white locusts devouring cassava leaves and corn stalks. At that point I truly understood how fostering relations with neighbors is central to the success of raising goats and how necessary opening lines of dialogue was needed to be a top priority. Community worker Beth Kyamazima working with the Batwa settlement of Keberimo writing down the ideas of the community members. More to come folks. Let me know what your thinking as you read these posts! At long last my return to Uganda was realized as I stepped off the plane to a cool black night at the edge of Lake Victoria. I was immediately reminded how fast changes occur in this country as I took the accordion tunnel from the plane into the airport. Just one year ago the same airport spat me out on the tarmac to make my way across the runway and to my baggage. I’ve been staying at the Backpackers in Kampala for the last two weeks getting my bearings and preparing for what is shaping up to be an incredibly busy 6 months back in Bwindi. My time has consisted of a large amount of e-mailing back to the states and to the 3H grant staff down in Bwindi, two hour long phone meetings with Tor Erickson, and six hours of Rukiga lessons each day. Accompanying me for the last week has been Chris Edwards, an eighteen year old volunteer from Nevada City who has signed up to put his shoulder to the Rotary 3H millstone for three months. He has jumped into the language lessons with me and is also assisting with the startup and design of our new Rotary 3H website (coming soon)! 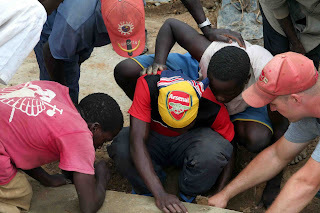 I was impressed by Chris’s ability to immediately pick up the Rukiga number system which in my mind has only been surpassed by his ability to down Coca Cola at a blistering pace. 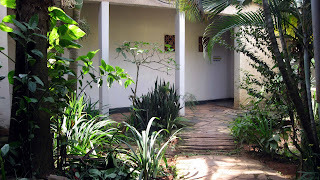 A view of the Backpackers Hostel, where Chris and I stayed in Kampala. 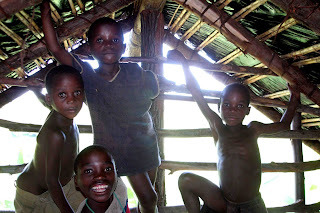 The Rukiga language is one of several Bantu languages spoken across Southern and Western Uganda. Many tribes share the same core Bantu language. The language of Southwest Uganda is Rukiga of the Bakiga people (note the addition of an “R” to change the people name to the name of the language). The language instructors are a married couple Richard and Doreen who teach with great humor and with great pride of their people and language (Doreen is of the Bakiga tribe and Richard of the Banyankole). The at times grueling six hour daily lessons are often intermixed with conversations about American and Ugandan culture. The days are punctuated with hourly frisbee throwing breaks that Richard and Doreen have taken such a liking to I’m not sure if they will let me return to Bwindi with my old Ultimate Frisbee disc. 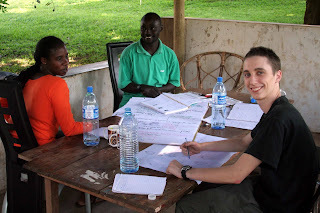 From left to right, Doreen, Richard, and Chris at our Rukiga lessons. Starting the classes I immediately began making connections in the language that had eluded me for the past year. Just working on the pronunciation alone has provided me the opportunity to use the vocabulary that I already possessed from studying notes that I had found online. It is literally a key, unlocking these words that I had been struggling to use for so long. The Rukiga language is filled with twists and turns that at times frustrate me and at other times provide me with new insights into the culture I have lived with for a year. What I have found is that the language is not so full of exceptions but filled with a vast multitude of options and ways to say what you want to say. Prefixes, suffixes, and infixes! litter the language changing the subject and meaning of verbs at right hand angles. There are scores of ways to greet people and ways to check in with how the day is going, how was the night, and how is the family doing. The language accurately represents the importance in the Bakiga culture for checking in on how your neighbors are doing. Ironically there is only one word for apologizing (and I think it is rarely used) and if you are looking for words of politeness you can forget it. Another interesting note is that the proper way to introduce where you are from is to say where your people are from because there is always an unbreakable link to your people that anchors you wherever you travel to. Armed with an improved understanding of the language and a year of experience under my belt I am chomping at the bit to get back to Bwindi and to the communities. Understanding the reality and the complexities of conducting humanitarian work sits at the forefront of my mind. Thinking back I arrived in Bwindi with a masters degree in hydrology, a water testing kit, and the ability to say ‘how are you” in Rukiga. My ability to greet, I quickly realized, was the most important of those three items I carried with me. 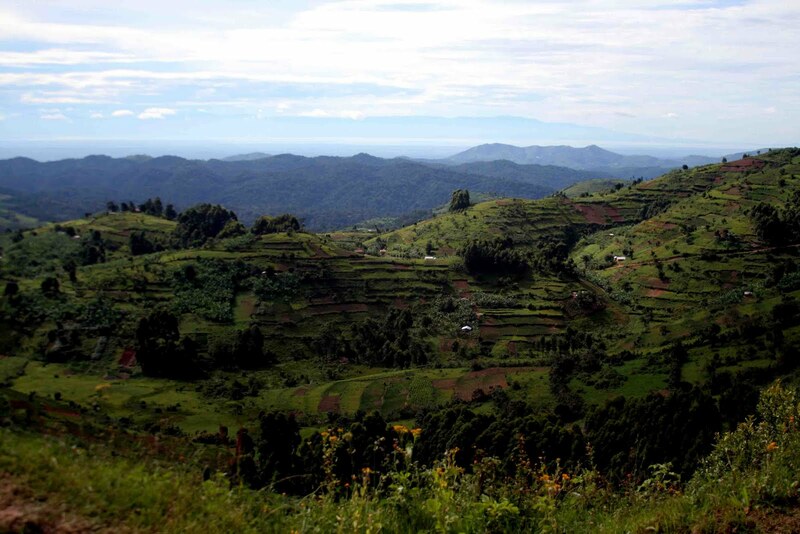 What one sees when they visit Bwindi is that humans are the exact product of their environment and the way they interact with that environment. Recent arrivals from the West are invariably struck by the masses of people seen walking on the roads. On market day in the nearby town/trading center of Butagota, you might pass several thousand people just walking: to sell baskets or mats, to buy food for the week, to collect debts or pay debts, to make business deals, to buy clothes and on and on. There are virtually no overweight people. When you do pass someone with a few extra pounds around the waist you take note. They are the wealthy and influential people in the communities and are both respected and feared. Just as there are no fat people you see few of the physical ailments that you often encounter in the West, like the back or joint pain associated with sedentary lifestyles. It is reasonable to ask whether the typical Ugandan villager suffers fewer muscle and joint ailments because of the physicality of life there or whether they are just able to ignore discomfort and pain because there is no alternative. Most likely it is a combination of the two. One invariably encounters women and adolescent children carrying 20 liter jerry cans of water or men hauling sacks of cement long distances on their heads or people working under hot and dusty conditions. I have a great deal of admiration for this type of physical work. When I express this to my partner Paul he will barely raise his eyebrows and nonchalantly state that these people are “used.” His meaning is not that the people are being used but that they are used to the hard work and the harsh conditions and that this type of work is what they know. Batwa women carry large bags of sand for a spring restoration project. I have found that being ‘used’ is something we can all relate to. We are all “used” in one way or another. 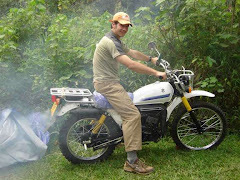 Whether it is to commuting three hours a day and sitting in front of a computer for another eight or pushing 300lbs of matoke (green bananas) on a bicycle 4 miles a day we are all adapted to our current situation. I think we all know this but in Bwindi it becomes overtly obvious. Communities are also “used” in the way they are set up and organized which is based on village leadership, local government leadership and by the resources available to them. In a sense these communities exist in a type of equilibrium, which is to say that people know their roles in the community and work hand in hand to sustain their families with the skills they have and the few resources that are available to them. By adding new outside resources or information to a community this equilibrium becomes disrupted. These disruptions can be positive, like in the case of effectively educating a community on the benefits of good hygiene and sanitation behavior. And they can be negative. I’ve seen a whole community collapse into angry quarrelling over being loaned a couple of hoes and shovels. (As a side note I believe this is one of the main reasons that the Peace Corps relies almost entirely on education of communities vs providing physical resources). One problem with providing resources is that they can be provided unequally. And even when they are provided equally they can still be perceived as being provided unequally. 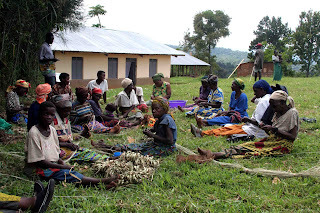 And perception can be an incredibly difficult thing to overcome where information is spread almost exclusively by word of mouth (one false rumor spread in Rukiga can take weeks if not months to sort out, stalling projects and creating arguments between community members). 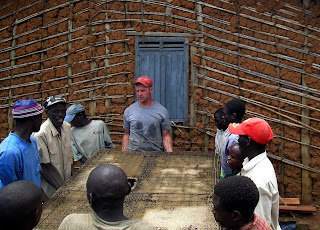 Tor Erickson teaches a seminar to Batwa masons. 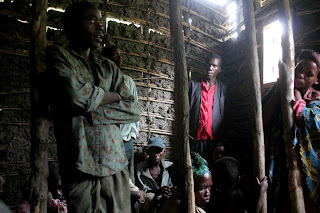 Batwa are often the intended recipients of outside resources as they are the focus of NGO’s and Missionaries because of their recent eviction from the Bwindi Impenetrable Forest and because of their apparent squalid living conditions. What many people do not understand is that the neighboring Bakiga suffer from many of the same issues caused by poverty such as poor sanitation, malnourishment, and HIV and their communities are interwoven with the Batwa. Projects focusing on the Batwa must often include the Bakiga as well. Because the Batwa are the target of so many humanitarian resources the Bakiga living in the same communities also look to benefit from the projects, and rightly so in many cases. Unfortunately the Batwa end up putting immense energy into projects, carrying bags of sand, cement, rock, and jerry cans of water and excavating large volumes of earth while the Bakiga refuse to work at all. However, when the projects are completed the Bakiga use the resources as if they were involved all along. Not surprisingly this causes deep frustration among the Batwa and leaves serious questions about where ownership lies with the project and who is responsible for maintenance. One example of this occurred when we built a water tank in the Batwa settlement of Byumba. It was a resource where the majority of the community were Batwa, but there were 10 Bakiga families (about one third of the total families using the resource) who gathered water there, as well. It was a constant struggle to engage the Bakiga beneficiaries and in many cases they would only reluctantly work on the project, all the while knowing they would benefit from the resource. To this day the Batwa struggle to engage the Bakiga in the maintenance of the resource. The spring committee formed to manage the project is currently working with the local government to set up a system where the spring taps are locked and only those active in the maintenance of the spring have access to the resource. One can see how tenuous a process this is when you consider that all it takes is one angry villager, denied access to the water source, to come in and break the taps to ruin it for everyone. It is now up to the people to make the hard decisions on how to involve the entire community and we can only provide suggestions and continue to monitor the water tank. Another challenge we have faced in the last year and will continue to face is trying to engage the Batwa in their own projects. 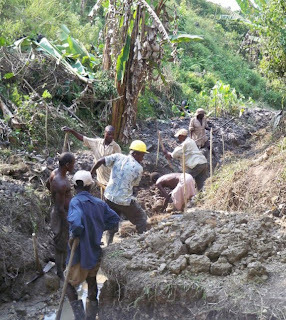 Right now there are four Batwa settlements preparing to build family latrines on the Rotary dime. Our expectation is that community contribution includes digging the 15ft deep latrine pits and assisting with the unskilled labor during construction . In the past the Batwa have always received some sort of compensation for any work they have performed, even when they were the direct beneficiaries of that work. This compensation usually came in the form of food. The assumption was that the Batwa are so impoverished that food needs to be provided to support the labor because the families are too poor to provide it themselves. And the Batwa will agree wholeheartedly. Providing this sort of compensation, however, adds a major complication to the process. The question then becomes are the Batwa digging their latrine pits for food or to have a latrine? And thus, if we provide food, is the community buy-in sufficient for ownership of the project, or can we tell if there is any community buy-in of the project at all? I’ve had many long, difficult meetings about this very topic with the Batwa where there has been a fair share of bitterness and anger. Many Batwa angrily tell me, “if you want to help the Batwa then help them in all ways.” Meaning, if you are going to help the Batwa build latrines, then pay them to dig the pits. Others, however, agree that the pit should be the responsibility of the families before Rotary gets monetarily involved. Although, in the end we have the final say whether or not to provide food for this labor our intention is to engage the Batwa in dialogue to understand what keeps them from embracing such a great opportunity to provide sanitation for their families. We are trying to move at a slow enough pace so that so that we can understand what their capabilities are and so that they can understand that we cannot justifiably lay these projects into their laps. In an attempt to commiserate I once told the Batwa of the settlement Bikuto that I understood that it was hard to dig latrine pits without being provided food. As soon as the words left my mouth I realized it wasn’t true. I had no idea. 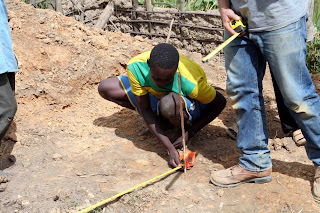 The next day I showed up at Bikuto at 8 in the morning with a pick and a shovel and a gallon of water and began working on one of the pits that had been moving very slowly. The work was intensely hard and as expected my hands, unused to digging, blistered badly throughout the day. I learned two very important pieces of information that day: 1) that a pit can be dug in clay soil at a rate of 1 ft per hour and 2) this work can be performed on an empty stomach. One must consider what the Rotary contribution to these projects will be. Rotary would be providing thousands of dollars of materials to build these latrines, we have trained 4 Batwa ferro-cement masons to build the latrines after the pits are completed (see the previous two blogs written by Tor Erickson), and we are paying the skilled labor to complete these projects. Where ,then, is the community’s opportunity to demonstrate buy-in to the project and to show that they are committed to sanitation. If they won’t dig their pits will they ever buy soap when they have some spare money? If they don’t participate in the construction of the latrines will they keep them clean down the road? Demonstrations of commitment now are the only clues we have that the projects will succeed in reducing water borne illness in the future. 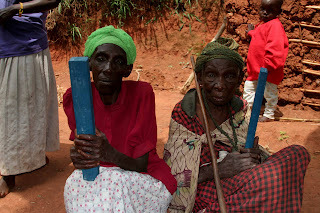 Two Batwa makakuru (respected elderly women) hold bars of soap. Written by Tor Erickson on his four months building latrines with the Batwa. Some of the names in this blog have been changed. I first met James in his native village of Kitariro in December, 2008. We spent two hours together, mapping out future sites of latrines and talking with families he had grown up around and known his entire life. 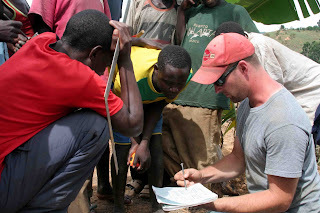 James had been appointed by his fellow villagers to help me with the task of recording the names of those who were slated to receive a latrine as part of the Rotary 3H grant. They chose him because he could read and write, and also spoke a little English. On our first encounter he was focused and serious. I liked him instantly. 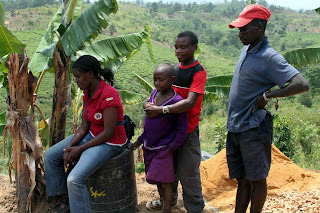 The second time our paths crossed was during the construction of the Rotary project’s first latrine. Some of the work for the latrine was voluntary, and some of it was paid. By showing up regularly and working hard, James managed to secure one of the paid positions. Nearly every day for a month I worked alongside him digging, mixing and pouring concrete, tying together the wire armature that would form the frame for the latrine, and mixing and applying plaster to that armature. During this time he showed an impressive capacity to apply himself to the task at hand and an equal capacity to speak out on occasion as an advocate for himself and his fellow Batwa workers. When a problem arose, and others would turn sullen and walk away, James would step forward and say his part with an energy that spoke of an intense, inner passion. The third and last time that we would have occasion to spend time together was in March, 2009, in the village of Bikuto, a tiny collection of mud and grass huts near the edge of the Bwindi Impenetrable Forest. 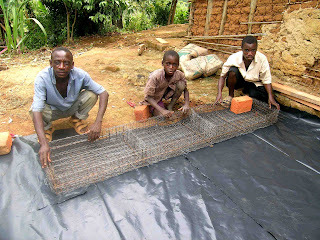 This time James had been chosen in a democratic process by his village to represent them in a skills-building workshop that I would lead, the goal of which was to place Batwa in the positions of skilled laborers in the upcoming construction projects called for in the Rotary 3H grant. The nature of my relationship with James had changed since the construction of the first latrine in his village. At that time, his role was that of a laborer and sometimes mason, and mine was that of foreman. Sol and I hoped that during the construction of that latrine, some of the technical skills involved would be picked up by the Batwa workers, James included, but our primary purpose at the time was to finish the project in the way that construction projects are approached in the United States: as fast and cheap as possible. Since then we had established a different set of priorities. 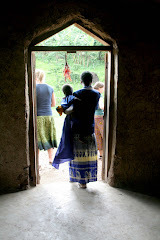 Our plan was to take a step back so that we could find the best way forward in working with the Batwa community. Now my interactions with James would occur in a classroom setting. 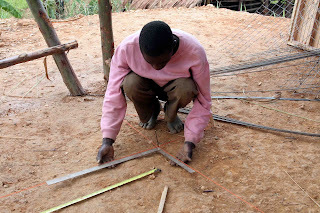 Success would not be measured by completing a latrine on schedule, or coming in under budget, but instead would be based on the answer to one question: did James and his seven other classmates in the workshop learn the necessary skills to complete construction of a latrine without outside help? We had one month. Tor going over technical drawings with the workshop members. The concept of the Bikuto workshop had evolved in the working conditions of the first latrine we built in the month of January. That experience had raised some tough questions about our approach and the attitude of the Batwa towards the Rotary project. In particular, we were forced to ask how to gather community support for a project whose initial conception and planning were undertaken outside of the community. There probably is no easy answer to that question but we thought that a start might be greater community involvement in the implementation of the grant, even at the more advanced stage where we found ourselves. We came up with the workshop as one way to facilitate that involvement. This was at the end of January. As Sol and I discussed whether or not to proceed with the workshop, a major factor was time. My trip to Uganda was originally supposed to last for two months, and my return ticket had been for February 8th. After a month in country I had changed that to April 8th, but this still left us with precious little time to organize and implement the workshop, especially when you considered the way in which we wanted to go about it. Sol and I had agreed that the selection of the participants in the workshop had to be democratic. The alternative would have been for the two of us to arbitrarily nominate participants of our choice (subject to the consent of the participant, of course). This would have been time efficient, but we rightfully feared that it would be a continuation of the sort of arbitrary exercise of power that had led to our initial problems with community involvement. By contrast, a democratic process of participant nomination, involving as much of the wider community as possible, would necessarily increase community participation and hopefully spark a deeper community response than we had been achieving. But democratic processes take time, and we were working with four different villages. This meant we would have to meet several times with each settlement to discuss the project, its scope, its intended purpose, and its methods. We would then have to ask each community to elect two representatives to attend the workshop, which would require discussion and meetings on their part. And if they needed more time or had more questions, there wasn’t much we would be able to do to hurry the process without threatening its democratic nature. All this had to take place in the month of February, so that the workshop could begin in March so that we could conclude it by the beginning of April, when I was set to return to the States. February was a very busy month. For weeks Sol and I traveled every day, sometimes together and sometimes apart. In the village of Kabyorwa we met with the Batwa in a circle underneath an emaciated shade tree. 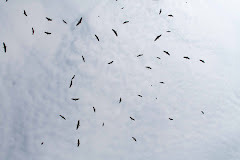 In Byumba it was on a patch of grass in the shadow of the newly constructed school. In Bikuto we perched on a bench on the edge of a ravine and in Kitariro I met with the assembled village in the carpenter’s shed. In each community we explained our plans and asked for feedback. In meetings that could last for three hours we brought first one, and then another, and then all four villages on board, each with the promise that they would choose workers by the end of the month, in time for the first day of class. On March 1st, one day before class was set to start, I didn’t know of one single person who would definitely be there. I honestly showed up the first day simply hoping that there would be someone to teach. Meeting held in the community of Kitariro. The women insisted on weaving their baskets while we talked. In all the time that I knew him, I saw James wear only two sets of clothes. The first was for everyday and work wear. It consisted of a pair of shorts, flip-flops, a collared, short-sleeved, knit shirt buttoned to the top, and an impossibly battered and faded red hat. He wore these clothes day in and day out, whether we were sitting in our makeshift classroom discussing fractions or pouring concrete in the baking, equatorial sun. The clothes were always clean. His second outfit I saw only once. It was for formal occasions. It consisted of dark blue-jeans, lace-up leather shoes, and a crisp, new t-shirt. This is what he was wearing on the day he showed up for class. He shook my hand and then went to change into his work clothes. The workshop was based on a simple premise. If we challenged and engaged the Batwa with something they judged to be worthwhile then they would respond by taking the initiative and applying themselves. The concept of ‘engagement’ was critical to our effort. Anybody who has worked in a job they didn’t care about knows what lack of engagement feels like, and anybody who has done work they care about deeply knows what it is to be fully engaged. You can’t force engagement, you can’t buy it with money and the only way I know how to measure it is in a conversation or by the look in someone’s eyes. And yet if we weren’t able to engage the Batwa we had the overwhelming feeling that our work in Uganda might produce some temporary changes in living conditions, but would leave the Batwa as a people no better off and perhaps even worse than before we had arrived. When the rain finally stopped and we emerged from Bunan’s hut, blinking at the light outside, we had spent over two hours in an abstract world of numbers. During that time everybody held the tape measure, everybody took turns reading it, and everyone measured something, again and again. Nobody wandered off, nobody took a nap, and there were no side conversations. Bunan working on his tape measure skills. The next day we set about building our classroom. I had spent many long nights thinking about this, and finally concluded that the workshop was going to fail miserably if we weren’t able to erect a shelter to keep the tropical rains off of us and our work. March 1st marked the first day of the rainy season, and we expected to receive torrential downpours every single day we were working in Bikuto. I had conceived of a shelter made from locally available eucalyptus poles and plastic tarpaulins, but the specifics were hazy. It was early morning, and all but one of the workshop participants had shown up. Everyone was milling around in an excited group, making connections with friends and relatives from different villages that they hadn’t seen in some time. “Okay, everybody, listen up,” I said. Conversation slowly ground to a halt and the group turned to face me. “We need to build a shelter,” I said. “With these.” I pointed to the poles. “And these.” The tarpaulins. There was a long moment of silence, people seemed to be waiting for me to say something else. I had no idea what that might be. “Now?” I suggested. 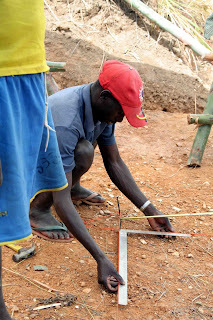 They exchanged looks, and finally Simon, one of the students from Bikuto, said, “We need tools.” We had tools. They needed nails. We had nails. They needed ladders. We built ladders. An hour later I stood back and watched as eight Batwa men attacked construction on their new classroom, setting poles, hammering in cross beams, and dragging tarps onto the rafters. And from the top of a precarious, homemade tripod ladder, James led the way, hammer in hand, pocket full of spikes, working with a focus and ferocity that spilled over onto his fellows. I’m not sure what it was specifically that caused James to excel in the workshop. Certainly a part of it was that he had at least a year of high school education, whereas most of the others hadn’t made it past third or fourth grade. And certainly part of it was that he was gifted with a natural intelligence and curiosity. He remembered things after being told one time, and if he didn’t understand a concept you could watch him working it over in his head, trying to sort it out until it made sense. And part of James’s success was due to his leadership abilities. Again and again the others would turn to him as a spokesman for their concerns or problems, and on any given project he would naturally take the lead, moving the others to their positions with short, snapped commands that grew quickly angry if he felt his performance standards weren’t being met, and then calm down just as quickly when they were . But I never saw this produce resentment or lead to a fight, and any crew James was working on produced the most efficient and cleanest results. I think his success was dependent on all of those things but none of them explained it completely. At least one other in the class had as much education as he did, and in the final exam that I administered, James finished second in both technical and verbal skills (first would go to James’s friend and neighbor, Godfrey, who aced the test with a grace and ease that left me choked up with pride). Instead, what it might have been, the common thread that extended through all of his work, was that James would invest himself in whatever it was that he applied himself to. James had a habit when he was working of holding one hand, fist loosely folded, tucked just above the small of his back. To watch him he could have been a British gentleman out for a stroll, or the image that came to mind more often, an artist at work on his easel. With the other hand he would hold his mortar trowel or set of pliers and do the work in front of him. From time to time he would step back and appraise his progress. Whereas most of the others talked constantly while they worked, telling jokes and stories, or complaining about the factors in life that created hardship, James worked in almost complete silence. It wasn’t that he wasn’t personable, or enjoyed conversation. At lunchtime I could often hear his voice rising above the others in a tale about this or that, stories that usually ended in a cacophonous riot of laughter. Instead, I believe his silence at work showed a deep focus on the task at hand. James in his Red hat standing next to Godfrey in his red shirt and Beth, our translator. I could walk away for an hour and return to the jobsite and without a doubt point to the area where James had been working. The wire was tighter, the wire ties neater, the mortar smoother and more evenly applied, the concrete better compacted. This kind of attention, which is actually the ability to see oneself reflected in the products of one’s hands, cannot be taught, it can at best only be nurtured. Teaching the workshop was exhausting and demanding. We had so little time, and there was so much to learn, that I pushed my students to the limits of what I thought they could take, mentally and physically. We would work as long as we could bear it in our open-sided classroom and then when the collective brain had reached its maximum level of saturation and attention began to wander, we would turn to back-breaking physical labor for a break. The raw materials involved in our latrines were sand, rock, cement, and water, and we carried all of those things again and again and again. I watched a 100 pound man sling a 120 pound sack of cement onto his head and jog with it up and down a valley. We raced with bags of sand and jerry cans of water. And when the day called for digging, the class fell to it with a vigor and determination that I was hard-pressed to match. And then when our bodies were exhausted, we would sit down again in the shade of our classroom and return to the abstract concepts of square, and straight, and plumb. The steep hillsides of Bikuto added greatly to the physical challenge of carrying 100 lb sacks of cement, sand, and gravel. Some days were better than others. Some days I would struggle with and fail to get past what I thought would be one, tiny concept, and some days the attention of the class would be so scattered that we would simply drop everything and devote the day to work with a wheelbarrow and shovel. I had plenty of time to reflect back on teachers in my past, many of whom I had shared with Sol, and their infinite patience in dealing with us students day in and day out. But then there would be days where the work flowed, and the students would jump to the next task, seizing initiative and leadership for themselves, taking the chalk from my fingers and drawing their own diagrams on the board to clarify the concept of fractions. I learned to live for those days and simply grit my teeth and bear it on the others. Workshopers crowd around to get a look at one of Tor's teaching points. And over time, the lessons started to catch on. Mixing concrete to a given ratio, measuring to within a quarter inch with a tape measure, building the wire armature for our ferrocement floors and walls, correctly placing steel reinforcement in the foundation, explaining the effect of water on concrete and mortar mixes, and, most difficult of all, precisely laying out the perfectly square perimeter of a foundation with stakes and mason’s line. Not everyone got everything, and there were some students who were clearly excelling: Godfrey and James from Kitariro, Bunan from Bikuto, and Christopher from Byumba, but as a group they began to consistently demonstrate the ability to complete tasks on their own. I took on the habit of splitting the class into two groups, leaving one to erect the plywood forms for the walls, or stretch wire mesh over the floor armature, while I worked on technical skills with the second group, and invariably when we went to check on the first we would find work progressing beautifully. 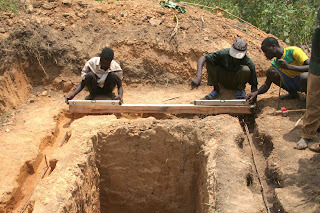 Kenneth, Tinfayo, and Bunan (from left to right) marking the depth that the concrete should be poured for the footing of a latrine . I couldn’t help but notice that when I wasn’t around they were starting to perform more efficiently and produce better results than when I was. I could only assume that without me present they were tackling the problems on their own without relying on me as a motivational spur. This was the best possible news we could hope for as after four short weeks of class I would leave Bwindi and any information or skills that I had failed to pass on would leave with me. Christopher (Tofa) honing his skills with the square. In the end there was a test. The test was a comprehensive review of everything we had covered in the past month. It had a technical, skills-based section that covered items like wire-tying, testing soil for its ability to support a structure, and laying out a foundation. The test also had a verbal section that asked the participants to name the four ingredients of concrete and to explain the function of wire mesh in ferrocement. Passing the test meant a pay raise and a job working on future Rotary projects. Failing meant a handshake and a thank you. This decision, to make failure an option, was perhaps the most difficult choice we had to make going into the workshop. Our final decision was based on two factors. First, making failure a distinct possibility would give a greater sense of importance to the work in the class. The second factor arose from a practical standpoint. It was possible that Sol would be working with these people for a long time to come, and if they were unable to competently and efficiently perform the work he needed it would inevitably lead to problems. Better to confront the issue now, up front. Administering the exam took just over nine hours. I met with one student at a time in the shade of our tarpaulin classroom. In attendance over the course of the day were a growing number of guests. The only thing we asked of a guest was that they participate in the exam by acting as an assistant to the student, holding the end of a tape measure or pulling on a sheet of wire mesh. The mood of the day was focused, but not somber. Bunan answered questions with the same ease and intelligence that he had exhibited for the past four weeks. Godfrey demonstrated a stunning competence and knowledge. James was so nervous and determined to do well that we stopped halfway through to take a break where he could take a few deep breaths. For some of the others, it was more of a struggle. Those who had demonstrated a high level of engagement through the workshop saw it reflected in their performance on the exam. For those whose attention had been elsewhere, or who tended to take a backseat while their fellows did the lion’s share of the work or answered or asked most of the questions, the test didn’t go so well. Of the eight students in the class, four passed. We informed people of their scores in the same way we had tested them, one at a time in a private talk. Sol delivered the news, but simply sitting there and observing when he informed those who hadn’t passed of the results was a gut-wrenching experience. Likewise, for those who had done well feelings of pride and happiness on my part were enough to bring tears to my eyes. As I tried to congratulate James on passing and explain in just a few short sentences what I thought his potential was, I was forced to stop a number of times as my emotions threatened to overwhelm. He watched me, his face an unreadable mask, nodded when I had finished, and turned around to walk away without a word before I chased him down to shake his hand. If all goes well, these will be the men to lead the Rotary construction efforts in Southwest Uganda. It remains to be seen whether the workshop will produce the results we desired. In my time in Uganda I learned that community ownership of a project can be an elusive thing to catch. For now my hopes rest with four talented, young men, one of them wearing a battered and sun-weathered, red baseball cap. Tor smiling for the camera and contemplating a sequel to his adventure in Uganda! 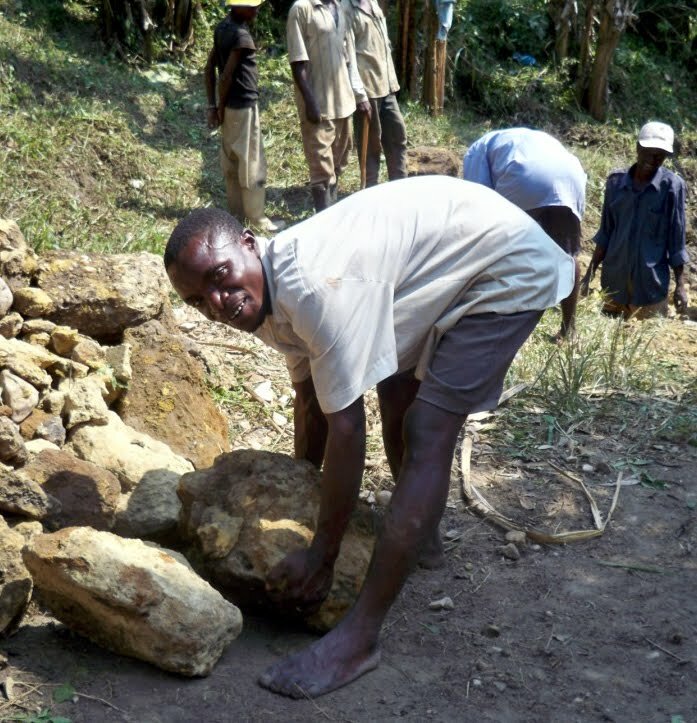 Tor and community memebers from the Batwa settlement of Kitariro setting a latrine floor in place. Bikuto is the most beautiful of the Batwa settlements in Kanungu District, a double cluster of mud and thatch huts spanning a deep valley. From a high vantage point in the village you can see for miles in all directions, and it's possible to be sitting in the sunshine and looking out across four or five ridges to a distant peak shrouded in black clouds receiving a heavy rain. The people from Bikuto are tough and out-spoken. In my time there I found them quick to laugh and joke, but just as quick to turn heated or angry if they sensed an injustice or a slight. There was Petronea and her husband Tegume, always active at some labor and always ready with a joke or a smile when I would show up in the morning. Or quiet Furjenz and his wife Generous, a strident defender of her family and village’s rights, and possessing one of the more impressive sets of biceps in East Africa. Then there was Jackson and Charles, both noticeably taller and more reserved than their neighbors. 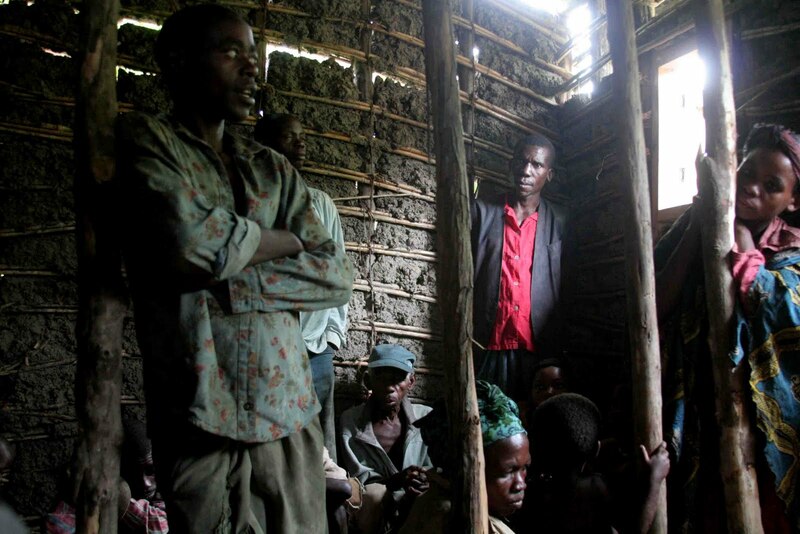 It was some weeks before we learned that these men had come from the south, from the district of Kisoro on the border with Rwanda, with their families several years earlier. Generous with her grandson Sol, believe it or not. Our plan for Bikuto was one that we had developed over the past three months of work in Uganda. 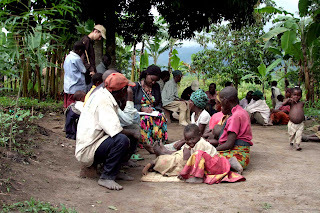 It derived from conversations with a number of NGOs and individuals doing development work with the Batwa. 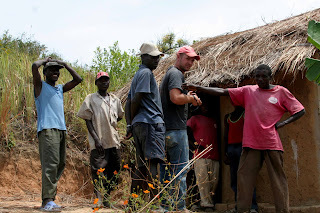 It was also a response to our experience of building our first latrine in one of the villages of Kanungu District. That experience, during the month of January, was instrumental in opening our eyes to the potential of development work to disempower those very people you are trying to help. It was also a hint that without the correct strategy working with the Batwa was not always going to be a joyous partnership of hard work and shared accomplishment. This last was a point that was driven home during the construction of our sample latrine. Most of our work had been theoretical up to this point, and this was going to be the first time that the Rotary 3H project was going to ‘get its feet wet’ and actually build something. Sol and I had a lot of different expectations and apprehensions going into this project but generally we expected to enjoy widespread community support. What exactly this support would look like, we couldn’t say exactly, but we felt certain that we would recognize it when we saw it and that it would involve some form of ‘chipping in’ on the construction project without expectations of compensation. What can I say? In retrospect those were naïve assumptions to the core and Sol and I received a brutal, overnight lesson in the realities of development work. This was perhaps best illustrated the day the chairman of the village was to put in his labor to complete the latrine. As part of the agreement we had forged with the village, every family that was slated to receive a latrine from the Rotary project would contribute a day of labor to the construction of the first latrine. This seemed logical to us as the sample latrine we were building would be used by the staff of the community clinic and by a community carpenter’s shop. It also seemed to make sense to us because by involving the community members in the construction process they could begin to learn some of the skills necessary to work on their own latrines. This labor was supposed to be voluntary and without compensation. 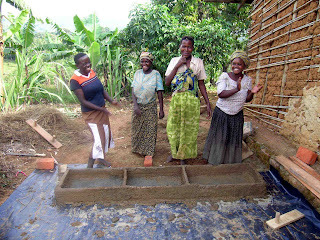 The women of Kitariro after plastering a section of floor for a latrine. 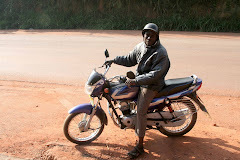 Every morning I would show up after an hour long motorcycle ride and meet with the Mukiga mason who was providing technical advise and experience to the project and see who from the village would be working that day. Work would then begin and we would set about accomplishing whatever that day’s task was, be it pouring a concrete foundation or framing the walls and roof. I felt that the best way to produce a good work ethic on the job site was to work as hard as I could myself and set the tone, hoping that others would follow along. It didn’t take long for me to realize this wasn’t producing the desired results. A couple of days into construction the chairman of the village, a man with impressive sideburns and a smile that suggested someone with a few too many responsibilities on his plate, took his turn to represent his family in the construction process. I remember working my hardest to tie together the wire armature for the floor of the latrine, baking in the sun, sweat pouring down my back, and all the while the chairman squatting back on his haunches chewing a piece of sugarcane, watching with curiosity. Through a translator I suggested he help with tying the wire. He shrugged. A bit later, I asked if he could perhaps cut us lengths of wire to make up the wire ties. He worked for a few minutes and then stopped, resuming his observational stance. I explained to him that our agreement was for a full day of work. Eventually he grew tired of my nagging and wandered off. 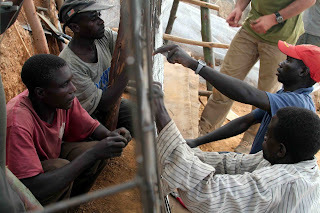 From left to right Mahano, Solomon, and Muhzei tying together a floor armature just before plastering with cement and sand. The chairman’s attitude though extreme was not atypical. Anyone who spent more than an hour on the jobsite would realize that something was not quite right. The Batwa had little to no sense of ownership of the process. They were interested in receiving the end product, a nice, permanent latrine, but their approach to the work said that they felt they would get it regardless of how much effort they put in themselves. This was discouraging. In fact, it was frustrating and disheartening to the extreme. We knew that at any point we could simply have spent a little more money, hired laborers and masons, perhaps even the same people who were supposed to be volunteering, and finished the latrine without a hitch. But there was something deep inside that balked at the idea, something that raised an eyebrow and cocked a head at the thought of paying people to do something beneficial for themselves, and something that asked the question ‘why wouldn’t they jump at the chance to help themselves and their community?’ So we hobbled through the first latrine, all the while vowing that the next one would be built under different conditions. In the meantime we had been slapped in the face with the question of ‘why’? Why were the Batwa acting this way? Why were they content to let a white-skinned foreigner labor away on one of their community projects while they sat idly by and chatted? Sol and I simply refused to believe what the local Bakiga people would earnestly tell us at every possible opportunity--- that the Batwa were lazy by nature and would never make good workers. These comments stunk of racism and besides, we had both seen the Batwa move and work with impressive energy and force when they felt so compelled. There was something about our project that had failed to hook them. They wanted latrines, they understood the need, but they saw the work that we were doing as something totally external to them and their efforts. We had come from somewhere beyond and when we left there would be a trail of latrines behind us and the Batwa could work or not and it wouldn’t change a thing. It was at this time that we began to think of the nature of development work that had come before us, and the effects that it had had upon the Batwa. It also gave us a chance to reflect on the dangers of a development project that is conceived and initiated outside of the target community. One of the greatest chances for ownership, project conception, had already been taken out of the Batwa’s hands. This was the fertile ground from which the workshop in Bikuto arose. We wanted a work environment with more accountability. We wanted a work environment that fostered a greater sense of community ownership of the construction process. And we had realized that the intangible things you leave behind you can be as or more powerful than the tangibles. In this case the tangible was going to be the latrine, and the intangible was how the community was engaged in constructing that latrine. Part of this engagement would be the learning of the skills needed to build it. 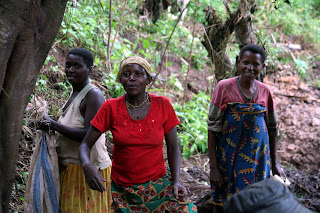 The typical approach when attempting some sort of a development project in a Batwa community in Kanungu district has been to hire skilled labor from the local Bakiga population and then utilize the Batwa to fill the role of manual laborers, carrying sand, water and other supplies, digging, and performing all the other odd ‘gofer’ jobs that a construction site demands. There are two main effects of this division of labor, neither one of them desirable from our point of view. The first was that paid Bakiga workers receive wages that were several times greater than the unskilled Batwa, effectively funneling a portion of the development funds out of the Batwa community. The second was a marginalizing effect on the Batwa as they watched outsiders do all of the ‘important’ work on the job while they themselves were left to do the menial labor. 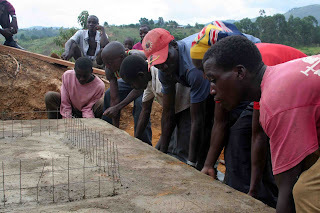 Our hope was that a workshop whose purpose was to teach the necessary construction skills to build a latrine from foundation to roof to a motivated group of Batwa would circumvent both of these issues. We also hoped that a skilled Batwa workforce would go a long ways towards engaging the community and would give the Batwa people a greater sense of ownership of the project (imagine you live in a small town and a big construction job comes up, say, to build a new county library. In one scenario a local contractor gets the job and every day that you drive by the jobsite you see people you’ve grown up with and have known your entire life doing the work. You might feel like the new library was more a part of the community, or that by extension you had some stake in it because people you knew were doing the work. And if the day came when the library was asking for volunteers to help out, you might be more inclined to show up, since it was someone you knew who was asking. Now imagine how it might feel different if an out-of-state contractor were awarded the job and he brought in his own, out-of-state crew to do the work). Batwa masons tying wires for a latrine floor. This was our basis for the workshop. By the end of January we had committed to giving it a try. The only problem was that we had only a hazy idea of what the workshop would actually look like. Who would participate? How would those participants be chosen? What would the curriculum consist of? 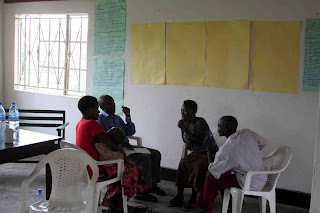 Where would it be held (this was before we had met with Bikuto and they had agreed for their village to be the host of the workshop)? In the next blog entry I will go into detail about how we answered these questions and how the workshop itself played out in the month of March. Don't forget you can click on the images in the blog text to view them full size! At long last transportation has arrived. Men rest in the afternoon heat beneath an incredibly twisted tree. Taken at a rural church a 1hr walk from the nearest road. I am a Hydrologist born and raised in Nevada City, California in the US. I obtained a masters degree from UC Davis in Hydrology with an emphasis on water quality in 2006. My great curiosity of the culture and landscape in East Africa led me to visit Kenya, Tanzania, and Uganda for the first time in 2006. 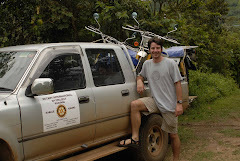 From there my interests became focused on using my skills as a hydrologist to perform humanitarian work in Uganda. Two years later I took a volunteer position with Rotary International as the director of implementation for water and sanitation projects in Southwest Uganda working with the Bakiga and Batwa tribes of the region. Currently I am residing in Addis Ababa as an intern with Oxfam Canada in partnership with the Coady Institute supporting asset-based community development projects in communities throughout central and southern Ethiopia.